The photoelectric effect calculator will give you an insight into the principles of the photoelectric effect which was explained by Einstein in 1905. It was a significant step in the development of quantum physics, which we know today. Read on if you want to learn what is the photoelectric effect and how you can describe it using the photoelectric effect definition. You will see that this quantum phenomenon finds an application in our everyday life, among others in photoelectric sensors that detect and determine the intensity of the incident light (with the photoelectric effect equation you can check if they will work at all in the sunlight). Everything in nature consists of atoms which are built of nucleus and electrons orbiting around the nucleus. Check our Bohr model calculator to find more informations about the structure of an atom. The photoelectric effect is a quantum phenomenon in which electrons are emitted from the surface of a material under the influence of incident light. Such photoemission can occur for any material, but it is most observable from metals. But why is there photoelectric effect at all? The rays of light consist of elementary particles - photons - which possess definite energy. On the other hand, every electron is bound to the nucleus with specific binding energy (you can quickly estimate this energy for hydrogen). Now, if photon collides with an electron and the energy of photon exceeds the binding energy of the electron, it can escape with some kinetic energy from the nucleus, giving rise to the photoelectric effect. h is the Planck constant h = 6.626 * 10^(-34) J * s.
You can see from the photoelectric equation that the condition f > f0 is necessary for the photoelectric effect to occur (because kinetic energy is positive). The quantity ϕ = h * f0 is called work function (expressed in units of energy) and it corresponds to the threshold frequency. 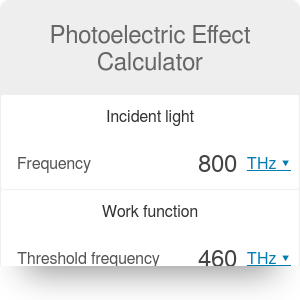 In our photoelectric effect calculator, the energy of the incident photon and work function are expressed as frequencies. You can go to the advanced mode if you want to use wavelength or just energy. Check our photon energy calculator to find what is relation between frequency, wavelength and energy of phonon. chemical analysis of a material. Photoelectric Effect Calculator can be embedded on your website to enrich the content you wrote and make it easier for your visitors to understand your message.